Ever since trying out entremet desserts from Milse, I’ve been planning on making some. 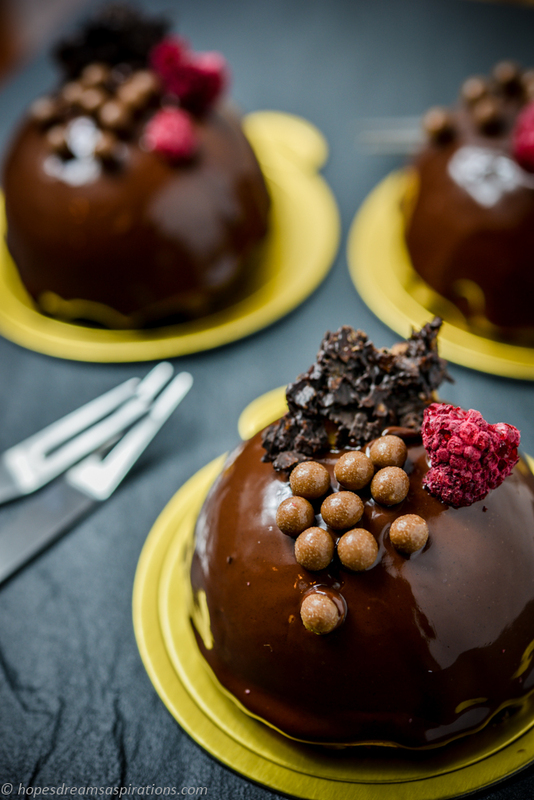 The making of entremets involve several more elements than other desserts. With cakes you may have cake batter, cream and ganache. With macarons you have the shells and the filling, be it buttercream or chocolate ganache. Entremets typically involve layers of mousse, cake, some ‘surprise’ element within and then a chocolate glaze or cocoa powder. There was a missing ingredient that had taken me a long time to find, but thanks to Equagold I finally got my hands on some feuilletine – crunchy ‘leaves’ – for my ‘surprise’ element. 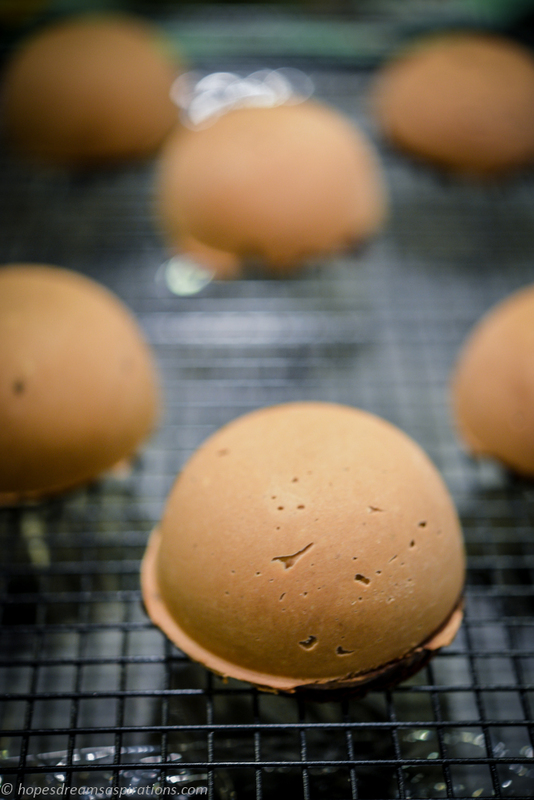 It also took me a while to find and master the perfect glaze as the shiny coating for these little domes. It wasn’t until recently when I flipped open Darren Purchese’s Sweet Studio book that I realised the perfect recipe had been lying around the house all along! I urge you not to be put off by the steps and the number of elements. The list looks long but if you plan ahead, like baking (or buying!) the sponge one night, making whatever filling (e.g. Salted caramel) another, you will have everything ready to assemble easy peasy. I looked at it as a massive mise en place and the assembling is truly the highlight and most fun part. The result is amazing and all the time spent in preparation worthwhile. So excited when I finally got them done, I had a goofy smile all day and could hardly wait for my colleagues to try. Chocolate Genoise/ sponge cake – you can use your own sponge cake recipe or store-bought cakes! See my recipe from the Salted Caramel Macaron post. I almost always have a jar of this in my fridge, so this element is ready whenever I need it. 1) Line baking tray with a sheet of baking paper. Spread feuilletine on baking paper. 2) Melt chocolate and pour over feuilletine. 3) Spread out and leave to cool. 4) Using a round cutter, cut out small discs. Alternatively, you can break them up into small pieces. Chocolate Glaze*prepare this 45 minutes before you unmold the domes as you need the glaze to be cool but still liquid. 1) Combine water, cream, sugar and cocoa powder in a saucepan. 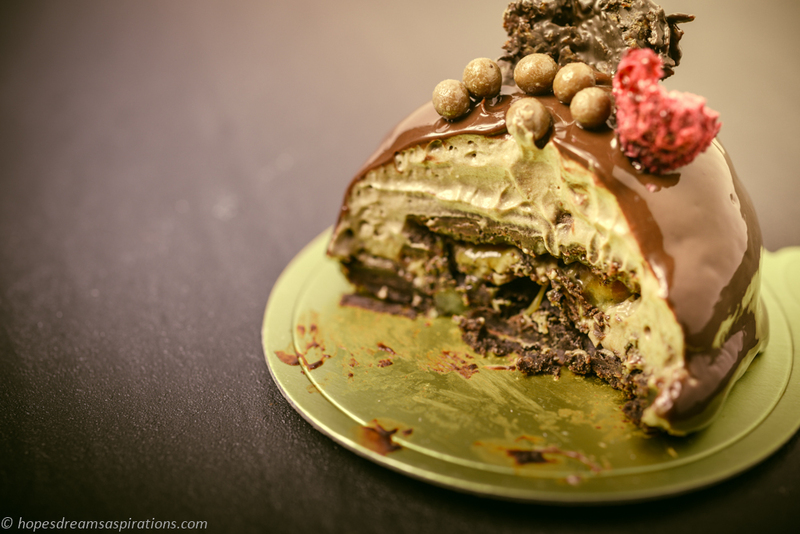 These little entremets are layers of mousse, cake, some crunchy, tasty element and more mousse. What you put in it entirely depends on your taste. 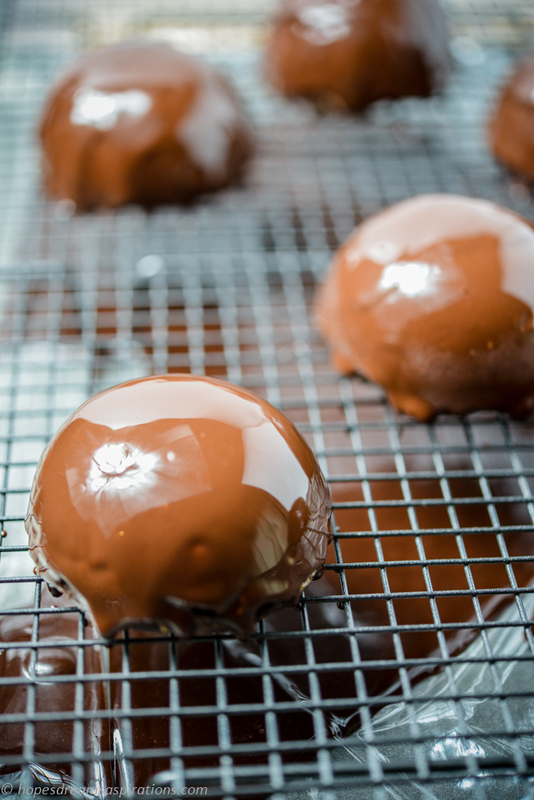 To finish it off a shiny chocolate glaze is poured on the frozen domes. 11) Decorate to your heart’s content. 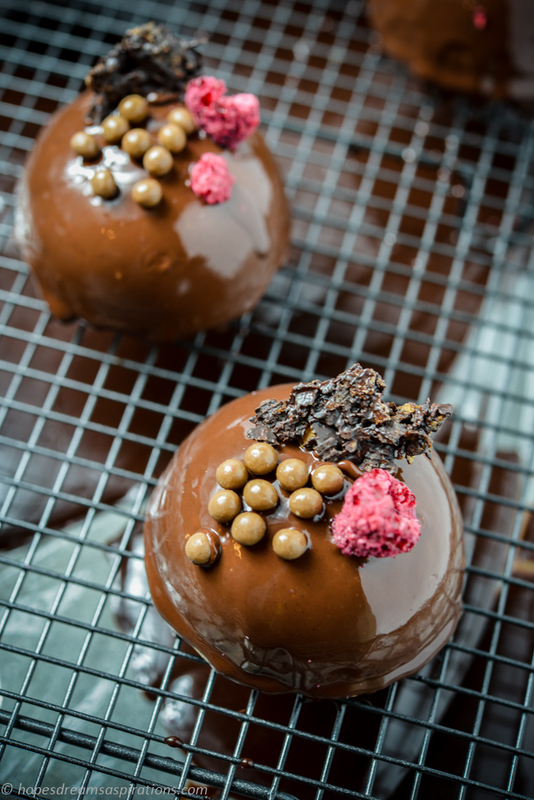 I’ve used Godiva chocolate pearls, more crispy chocolate feuilletine and freeze-dried raspberries here. Your pictures are gorgeous! They look really delicious! Thanks for sharing!!! Hi! Nice recipe….wanna try it. But i hv a qns. Can i use gelatin powder instead of leaf? I can only get hold of the powder version…..and how much if powder shld i use? Hi there! Sorry it took me a while to reply. Your question about usage of gelatin powder – the answer is it depends. In this recipe, it requires the addition of the bloomed gelatin sheets into the mousse and glaze. If you were adding gelatin powder to a mix you would have needed to bloom it in a volume of liquid before adding to the other elements. It wouldn’t be possible i think to do so here without adjusting the liquid volumes of the other elements and I haven’t tested that. In general 1 sheet of gold strength gelatin is 2g and titanium strength is 5g. If I’m mixing liquid elements I could use powder or leaf, in the same equivalent weight of gelatin. I.e. if the recipe called for 2 sheets of gold strength gelatin, I can use 4g gelatin powder. Good luck and I hope you can source some gelatin sheets as they are really handy for desserts.